The Simplicity Cycle is an engaging and accessible field guide that equips readers with practical tools to produce elegant, effective designs. It takes a deep but lighthearted look at the way complexity enhances or diminishes the things we make and use, from PowerPoint presentations and pizzas to spacecraft and software, and shows readers why simplicity is the key to innovation and good design -- whether you're creating new products, services, or consumer experiences. Humans make things every day, whether it's composing an e-mail, cooking a meal, or constructing the Mars Rover. While complexity is often necessary in the development process, unnecessary complexity adds complications. The Simplicity Cycle provides the secret to striking the proper balance. 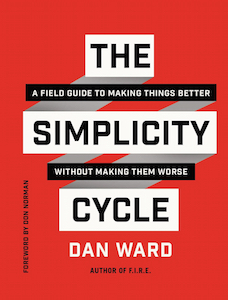 Dan Ward shines a light on how complexity affects the things we make for good or ill, taking us on a journey through the process of making things, with a particular focus on identifying and avoiding complexity-related pitfalls. The standard development process involves increasing complexity to improve the outcome, Ward explains. The problem comes when the complexity starts getting in the way-but often we don't know where that point is until we pass it. He suggests a number of techniques for identifying the problem and fixing it, including how to overcome several types of wrongheaded thinking-such as the idea that complexity and quality are the same. In clear, compelling language, and using his trademark mix of examples from research, personal experience, and pop culture, Ward offers a universal concept, visually described with a single, evolving diagram.